So you can imagine the reception President Jean Mayer received when he called for a veterinary school to join Tufts’ schools of medicine and dental medicine, in a synergistic approach to health. 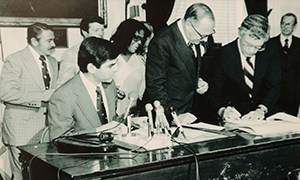 “We can build a unique health education system, unitary in philosophy and regional in scope, which can be a model for the nation at large,” he said in his 1976 inaugural address. The odds of success didn’t look good. New England hadn’t had a veterinary school since Middlesex College closed in 1947. Even Harvard University’s school, the region’s first, closed in 1907. And yet the start-up school, with no facilities and active resistance from other universities, became one of the finest veterinary schools in the country, and revolutionized animal and human health worldwide. Here is the beginning of that story, told by some of the people who lived it. Former Provost Sol Gittleman: Tufts University was already in financial stress—and without any innovative genes in our body—when in 1976 President Jean Mayer announced that he wanted to start a veterinary school. Everybody expected only disaster. Tufts eventually received $200,000, and put forward a plan calling for veterinary students to be educated alongside Tufts’ medical and dental students in Boston, with clinical teaching at locations run by partners. The university’s board of trustees would need to sign off. Distinguished Professor Emeritus Irwin Leav: I was a tenured professor at Tufts University School of Medicine when Katherine McCarthy, the provost, approached me to say Jean Mayer wanted to talk. He wanted me to help start a veterinary school. I thought, Wow, that’s a big undertaking. No one here seemed to know what a veterinarian was—people saw “Irwin Leav, DVM” on my office door and thought I had some sort of foreign medical degree. Associate Professor Emeritus Lawrence Kleine: I was director of radiology at Angell Memorial when Irv Leav asked if I was interested in being part of a working group to discuss the requirements for a school. The group met half a dozen times to discuss admissions criteria and curriculum during our “free” time, often on weekends. 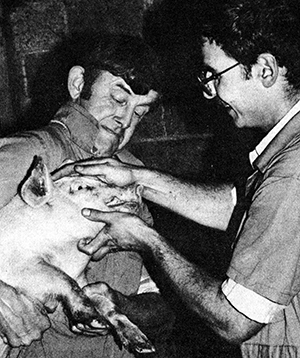 Assistant Professor Emeritus George Looby: I served on a Connecticut state veterinary association study committee, and most of the veterinarians had negative feelings about the project. How was a small liberal arts college in urban Massachusetts ever going to manage this? And where would they get the money? Governor Michael Dukakis, representing the Commonwealth of Massachusetts, conveys the 562-acre Grafton campus to Tufts University. Dukakis: The question was where to put the large-animal facility that the school needed. Fortunately, the Grafton State Mental Hospital recently had closed down, which was perfect timing. The parcel was just sitting there. So we worked things out so that a chunk of that land was made available to Tufts. Gittleman: Dukakis gave us the land for a dollar. 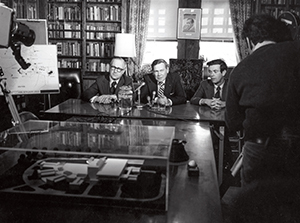 On April 29, 1978, the board voted to establish the first major new school at Tufts since the Fletcher School of Law and Diplomacy in 1933. Leav convinced Al Jonas, a tenured professor at Yale’s medical school, to take a chance as dean. And Tufts began accepting applications for the Class of 1983 (many early students went on to become professors). At the time, only three veterinary schools in the country accepted New Englanders–the rejection rate sometimes exceeded 93 percent. Professor Emeritus George Saperstein: The original bulletin announcing Tufts’ new veterinary school heavily promoted that it planned to train the veterinarian of the future. It would educate veterinarians to work in biomedical research, marine science, agriculture, wildlife medicine, equine sports medicine, and animal welfare. Janice Lennon, former associate director of continuing education: In 1978, the school had only a small presence at 193 Harrison Avenue in Boston. But Jean Mayer had made a public announcement about establishing a school, so the telephone calls began. Distinguished Professor Emerita Susan Cotter: [Janice] would answer the phone and say, “I’ll connect you to Admissions,” and then she’d talk on the phone in a different voice like she was a different person. Lennon: There wasn’t much solid information early on. When the telephone inquiries came in, I would attempt to respond, posing as admissions or financial aid. Former New Mexico Commissioner of Public Lands Ray Powell, V85: New Mexico didn’t have a veterinary school. When I met Irv Leav, I was employed as a tennis coach and working on a master’s degree. He interviewed everyone in one day, and I had to come straight from the tennis courts in my gear. Clinical Associate Professor Robert McCarthy, V83: If you were from Massachusetts, you could apply out of state [to other schools], but it was so restrictive, you probably weren’t going anywhere. Professor Emeritus Anthony Schwartz: Outside Tufts, UPenn and Cornell both lobbied against the establishment of the school, because they felt it was going to take students—and financial resources—away from them. Clinical Professor and Chair of the Department of Environmental and Population Health David Lee-Parritz, V83: There were people in our class who had applied to veterinary school for six, seven, eight years in a row. McCarthy: I actually got into Harvard Medical School, and my family thought I was crazy when I went to veterinary school at Tufts instead. Associate Professor Emeritus Mark Pokras, V84: So when Tufts’ new school opened, it was like the dam broke. There was this flood of older, experienced applicants. These were people who knew what they wanted—a program that was going to deliver a state-of-the-art education—and weren’t going to take any nonsense. There wasn’t much money to hire veterinary faculty, but Tufts’ One Health mission meant its other schools could help. Schwartz: The first two of years training fell on the backs of the existing medical school faculty. McCarthy: They didn’t know what to do with us. We’d have a class on some disease and then right at the end the poor instructor would try to include something related to veterinary medicine. Lee-Parritz: The medical students thought they were better than the veterinary students, and the veterinary students thought they were better than the medical students. Assistant Professor Emeritus Steven Rowell, V83: If a professor talked about the digestive system of a cow, there were a few medical students who’d yell, “Moo!” from the back of the class. Lennon: There always used to be a couple of mounted police up by the corner in front of Filene’s. I’d run over there with a cup of coffee and ask the officer to come down to Kneeland and Harrison Avenue so the students could palpate the horses’ abdomen and legs. McCarthy: From a One Health perspective, it was awesome. We got a medical and dental education also, and many people later did go into research and other areas beyond treating animals. Rowell: When it came time for grading, the medical students were upset because the veterinary students were altering the curve upward. The school was estimated to cost $31 million, with $10 million from federal appropriations. Most would go to building a large animal hospital and other improvements in Grafton. Pokras: In the fall of 1980, they loaded all of us onto a bus to take a trip to what would become the Grafton campus. Lee-Parritz: When the state closed the [former mental] hospital, they just turned off the lights. There were medical records all over and some barbaric-looking equipment. McCarthy: There were tunnels and places with beds and weird machines. Rowell: At Halloween, we scared the bejesus out of each other by jumping out of the abandoned buildings and the tunnels that ran in between them. Schwartz: The amount of time we had to get the school set up was limited. The resources were even more limited. Clinical Professor Mary Labato, V83: My classmates repaired barns and built fences for work study. Finally, by our third year, they would tease us by having some classes out in Grafton. We’d have lectures in the administration building, and there was really nothing out there except for a little canteen truck. When it pulled in, the receptionist would come running into the lecture hall and yell, “Truck’s here!” Lecture would stop, and the class would go out to grab a coffee. Gittleman: The first members of faculty were adventurers. Saperstein: We knew what students needed to learn, and we taught it. We wanted them to get a balanced education with a variety of species—that’s the beauty of veterinary medicine. Rowell: Class and labs were 8 to 5 every day, and we’d be back in the labs on nights and weekends. There was just too much information to do it all without that additional time. Third year, we were taking twelve courses at once. Leav: The faculty were hard to recruit, but once they were in, they gave everything to it. It was a gigantic team effort that was also very disparate—and desperate—at times. Saperstein: Roger Spidle, associate dean for administration, had scrounged a whole MASH unit from a town’s bomb shelter that was built during the cold war. So we held a goat surgery lab in the basement of the administration building using Army-surplus tables, suture material, and instruments. Cotter: I remember putting all the small-animal courses together with Jim Ross, our department chairman. The first time I walked in to lecture a third-year class, they were all looking back at me like I knew what I was doing. Pokras: That ’83 class literally didn’t know on a Tuesday what classes they were going to have on Wednesday. Saperstein: We taught the students common, but sophisticated, bovine surgeries in a barn that didn’t have electricity. We didn’t realize that students would operate so slowly. We were still going well after dark, our only light from the students’ penlights. Rowell: Sometimes when I talk to former classmates, they jokingly ask if Tufts has electricity in its labs now. In their third year, students began their “on-the-job” training, divided among multiple sites. 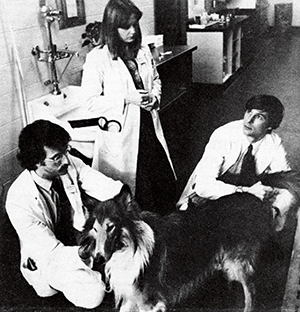 Before the openings of the Hospital for Large Animals in 1982 and the Henry and Lois Foster for Small Animals in 1985, students cared for large animals in a temporary clinic in Grafton. They saw small animals at Angell Memorial Medical Center and South Shore Veterinary Associates (now VCA South Shore Associates). Another group spent every Wednesday going on farm calls with the new Tufts Ambulatory Service. Rowell: Students needed to be able to care for livestock, so Tufts bought George Looby’s practice in Woodstock, Connecticut, which became Tufts Ambulatory Service [now Tufts Veterinary Field Service]. Looby: We didn’t have a place to gather, so, by necessity, we met in the basement of my house. As time went by, a certain lady who lived upstairs said enough is enough. So in 1981, we found a Realtor who let us rent some space in the house he used as an office. Saperstein: The beauty of [buying the practice] was that Tufts instantly had a food-animal caseload without taking business from any other practitioner. I wondered how the farmers would feel about going from having private-practice veterinarians to academic ones, but the transition was seamless. McCarthy: It was awesome. It was literally like James Herriott—really old-school, large-animal veterinary work. Saperstein: We’d sometimes have as many as 16 students, so we’d drop the second-years off at the farms. We’d pick them up after dark after a day of milking or shoveling manure. 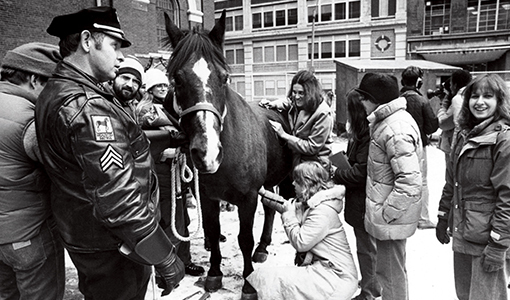 McCarthy: Even though Tufts had no small-animal facilities, we got a great clinical education. The clinicians at Angell Memorial and South Shore Veterinary Associates were amazing. But life became much harder as we started to rotate through the clinics. There was carpooling and so much commuting. You studied on a bus. Lee-Parritz: The large-animal hospital opened as the first-year class began our fourth-year clinical rotations. Rowell: We had to be on call in Grafton, so we couldn’t go home. New England Aquarium Senior Scientist Rosalind Rolland, V84: We often slept over on cots up on the third floor of the administration building. Lee-Parritz: It was impossible to sleep over there in winter. Because the hospital was not very busy and the cow part was completely empty, I slept over there in the bales of hay a couple of nights. The pressure on students and faculty mounted as the fall of 1982 neared. Rowell: There was almost a palpable question mark as the national licensing boards approached: How are these students going to do? Lee-Parritz: It was nerve-racking. We had to take for granted that we had been taught the right things. Rowell: They didn’t offer the exams in Massachusetts, so a number of us piled into cars and drove out to Syracuse, New York. We all crashed in sleeping bags and took the exams the next morning. Many of us came out panicked because it was so hard. I was almost in tears. Lee-Parritz: But we all passed. Lennon: Those first classes did so well on the national boards. Rowell: The school was vindicated. On May 29, 1983, fifteen women and twenty-one men received their diplomas—the first veterinarians trained in New England in decades. Lennon: The graduation ceremony had to be moved from in front of the large-animal hospital when startled horses accompanied the brass band with heehaws. Lee-Parritz: Do you know the medical term “dystocia”? It means “traumatic birth.” Dystocia was the name of our yearbook, which I think was appropriate. Associate Pofessor Emerita Linda Ross: The students deserve a lot of credit for being patient and putting up with so much that was unknown, and for being such good people and such good learners. We owe a lot to them; I certainly do for my teaching career. Rolland: Tufts provided an incredible comparative background that has allowed me to work on different species—everything from dogs and cats, to primates in Africa, to albatrosses, to whales. Powell: One reason Jane Goodall hired me was because of the background I got at Tufts and the ability to look at animals through a very different lens. Tufts taught veterinarians to be problem solvers in a way that I don’t think anyone else was doing. Schwartz: The best measure of the school’s success is that people stayed there [as faculty] and did wonderful things in their careers—and changed veterinary medicine in the process. Dukakis: Tufts’ veterinary school marked the beginning, really, of the state’s biotech revolution. The school was a wonderful addition to the state’s economy. Now it’s one of the best veterinary schools in the country. Gittleman: It’s still different from other schools. They got into sports medicine early. They were into animal safety and welfare early. That was revolutionary. The veterinary school turned out very good science and became extraordinary. It changed how we approach not just animal health, but human health, too. McCarthy: This school has always been a little bit of an outlier, in a good way. And they have stayed true. I don’t know how they’ve done it, but they have. Gittleman: The miracle in Grafton; that’s what it really was.